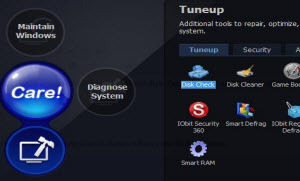 Advanced SystemCare Free is a software that will keep your computer system clean and properly running with the help of all the tools possible. IObit Advanced SystemCare will clear your disk fragmentation, security scanning, Internet surfing history and more. Advanced SystemCare main window provides access to the main functions of the application, so that you can immediately initiate a 'Quick Care', a 'Deep Care', start a so-called 'Turbo Boost' or enter the Toolbox. Toolbox offers startup manager, disk cleaning, privacicy sweeping and file shredding. Advanced SystemCare is a great helper if there's something wrong with your machine. It will find all the performance issues and fix them in a few moments, but make sure to perform regular scans if you want to keep the system firing on all cylinders at all times.